Stunning 70" monitor elevates office collaboration. Present in Full HD, with a 16:9 aspect ratio and high brightness of 400 nits. 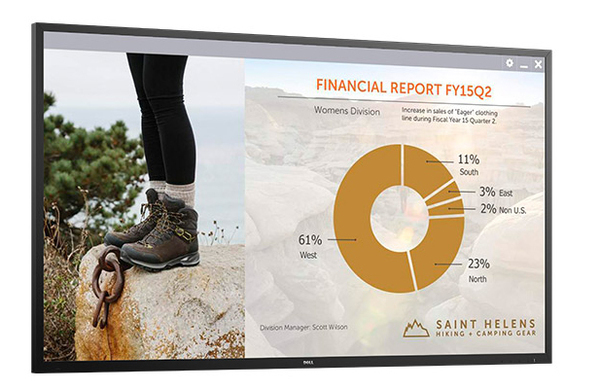 The wide viewing angle and massive 70” display offers incredible visibility in both small and medium-sized conference rooms. Colors remain consistent, so every seat is the best seat in the house. Display is automatically adjusted to reflect your PC’s resolution and aspect ratio. Connect with ease via VGA, HDMI, DP and USB ports. Easily adjust the brightness or volume with an included remote control. Your monitor can become an easy-to-use web conferencing hub with your favorite video conferencing solution. An extra-large tilt mount comes in the box, for perfect positioning with no extra accessories needed.